We are a registered Ontario producer of high quality spinning wool and purebred livestock from our small flock of Rambouillets. Rambouillets are a large breed that is a direct descendent of the Merino; in fact, they are often referred to as the French Merino. They are rare in Ontario but are common in Western Canada, as they can do well as range sheep. They have a strong herding instinct making them ideal for small flocks, easy handling, and also for herding with the use of herding dogs. Ewes are naturally polled, while rams are typically born with horns. They are always white making their wool ideal for dying. We have searched Ontario and beyond for some of Canada's best spinning wool sheep. The fleece of the Rambouillet is some of the finest sheep fleece available and is typically less than 25 microns and a staple length of 6-10cm. Their wool can be used for almost anything and is soft enough to use for baby garments. Because of their large size they provide a large yield of fleece and have less lanolin than other comparable breeds like the merino. Not only are they great for wool, they are excellent for meat and are considered one of the best dual purpose breeds out there. Their dual purpose qualities make them a profitable breed of sheep to keep. Because of their size they are good at lambing and have a lambing rate of approximately 1.75 and sometimes higher. Checkout our rundown of what makes our wool so special in Ontario. Our wool is typically available in braids of beautiful un-dyed combed top in 4oz runs among other custom combinations on request. We can ship via mail to most parts of Canada but it's always better to come out and see us at a local wool show. fleece, yarns, pottery and so much more! Tara and Brendan will be attending the festival to showcase and sell our yarns and goods. See you there! From time-to-time we have limited selections of our homestead products available to purchase online. Check out our online store for secure purchasing, with flat rate shipping and free pickup available. It takes a full year of very hard work and many hands to produce our wool. As small farmers, we find it absolutely amazing, inspiring, and heartwarming to see what talented knitters can create with it. We're compiling a growing small gallery to show off creations as we find them. Thanks for sharing everyone! Created by user Piccola via Ravelry. 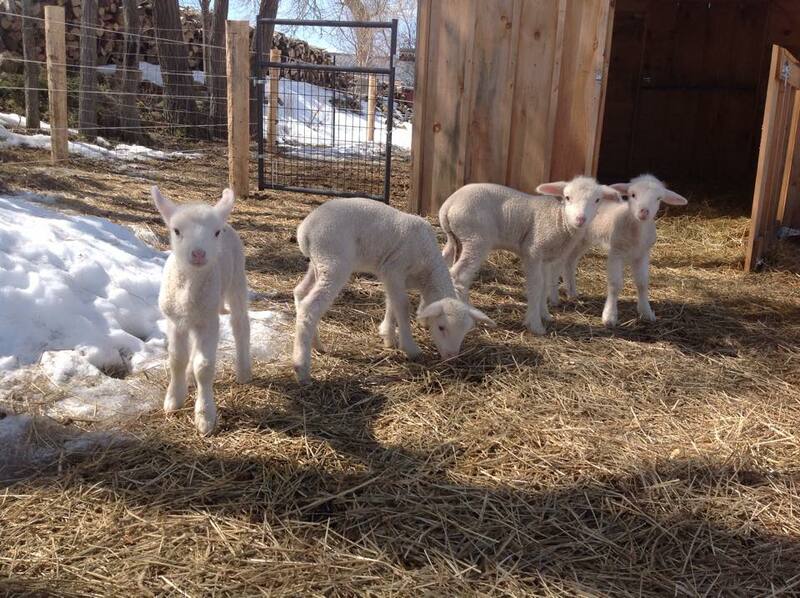 We typically lamb in the spring around April, with lambs being ready for their new homes in late June/early July. If you are interested in acquiring lambs, please let us know by putting yourself on the contact list below or reaching out to us directly by phone or e-mail. Depending on mother nature and your expressed interest, we may contact you during lambing season if a match can be made. When lambs are ready, confirmed orders will require a small downpayment to secure your lambs for holds. Note: Lambs born from distinct (B and C) flocks can be bred. Lambs from the same flock share the same father ram and cannot be used for breeding pairs. How many rams/ewes? Notes? Questions? Thank you! - We will reach out to you during lambing season. We are an Ontario registered beekeeper housing multiple colonies of european 'Buckfast' bees. A special breed first introduced by Karl Kehrle, the buckfast is a gentle but hardy breed with a keen sense of smell and foraging zeal. Our well loved bees produce a small annual harvest of white honey sourced from Dorchester-area wild flower, gardens, and field clover. At summers-end we extract, step-down filter, and then package on-farm to produce a delicious white unpasteurized honey in 500g glass jars. Great on toast, in tea, or your favourite recipe. Our honey is currently available on some local grocery shelves in Huron and Lambton counties. Ask for us where you shop! For this year's harvest, look for us at your local market or ask us about pickup/delivery. Interested in a wholesale, bulk, or larger order? Our natural honey is a fantastic recipe component and we can accommodate some wholesale orders. The volumes we have available each year can shift up or down based on all kinds of natural factors. If you are interested in placing a special order please reach out. If you are looking for someone to extract your small collection of hives, we would be happy to extract your honey for you on our farm and save your kitchen from a sticky mess. More information can be found on our Honey Extraction Services page. Bees truly are amazing little creatures. 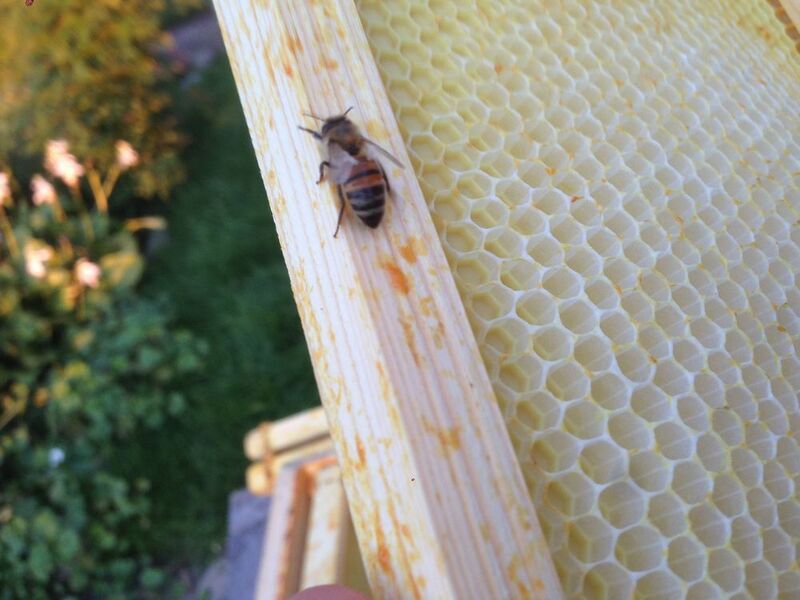 Not only can they produce a beautiful honey, they can collect other great products like propolis, wax and pollen. During harvest we remove wax cappings from our hives and have an abundance of amazing natural byproducts. In the true permaculture spirit we often try to make the most out of what our animals give us and produce small batches of seasonal speciality goods. Not only does this stuff smell great, it tastes great too! 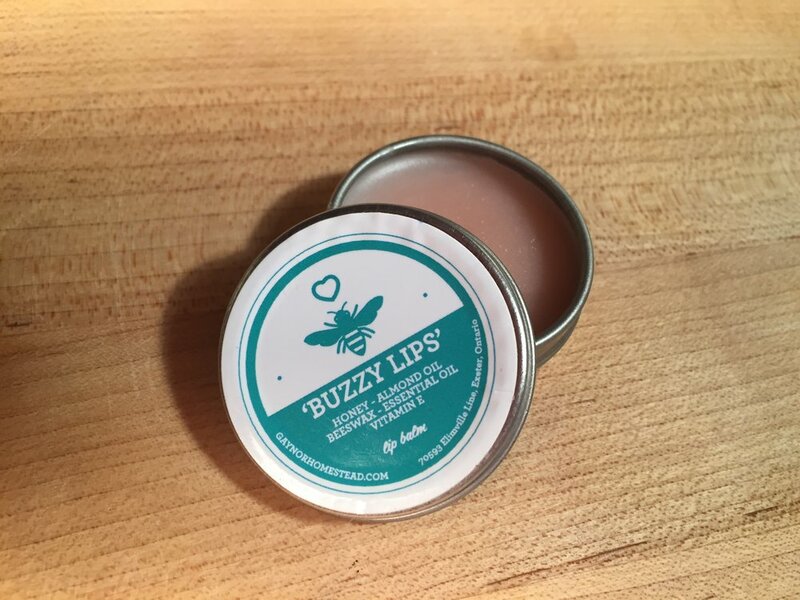 Buzzy Lips is packed full of vitamin E, natural bees wax, honey and almond oil. Tara adds a dash of pear fragrance oil to make it just a little extra special. Wintertime does not have to leave you with dry cracked hands if you rub some buzzy hands into it. Made slowly with simple ingredients, this stuff has a healthy dosage of vitamin E, bees wax, coconut oil, almond oil, honey essence and starches. The wax helps repel water while the vitamin E and oil will aid damage. Made without preservatives, the cream will keep for weeks when refrigerated. These soaps not only look pretty, they smell great too! Our homestead soaps are created to be healthy for your skin and keep you clean. Our farmer friends claim they’re the only soap bars that can cut the grease. While other friends say that they are great for their skin. Bee better is a vapour rub we find useful during tough cough and cold bouts. Apply a generous amount at bedtime for easier breathing during otherwise stuffy nights. Southwestern Ontario is the perfect climate for growing corn. Each summer we grow, husk, and hand package our own popcorn on-farm in mini-packs you can pop at home. Each cob pops up to a nice white fluffy snack that is the freshest popcorn ever. Select products are available online for delivery or even local pickup. Check out our secure online store for details. On special orders we can deliver to areas in and around London. (excluding farm-gate products). Visitors by appointment are always welcome.